The Port Authority Police World Trade Center Traveling Memorial, Inc. is a Nonprofit Corporation in the State of New Jersey. 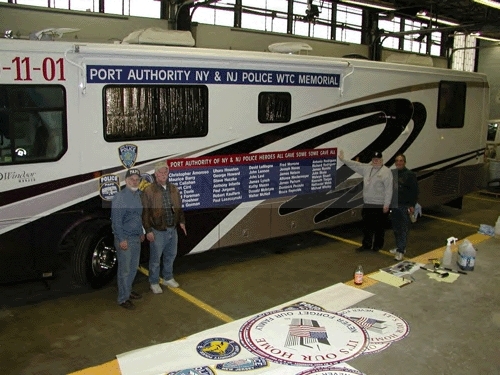 The Traveling Memorial consists of a Monaco Motor home, respectfully transformed into a Memorial on wheels emblazoned with the names of 37 Port Authority Police Officers, 38 Civilian Employees of the Port Authority, 23 New York City Police Officers, and, Sirius, the Port Authority Police K-9 who died on that tragic day. ALL HEROES! It is also a Mobile Exhibit containing an extensive pictorial display, a video documentary, and numerous genuine artifacts recovered from the site of the World Trade Center known as Ground Zero, including police car doors, airplane fragments, and, much more. The Memorial is a tribute to all victims including those at The Pentagon, and the four hijacked aircraft. It is truly a tribute to all those who tragically lost their lives, with special dedication to the 37 Port Authority Police Officers who died that day. This was the largest loss sustained by any police department on a single call in American history!